With a comprehensive 600-point (click for list) pre-purchase inspection from Auto P. I. Used Car Inspections, you'll know the exact condition of the vehicle. Once you know the exact condition of the vehicle can you determine its true value. Auto P. I. will travel to a used car lot, individual seller's home, or where ever the vehicle is located. Our vans are fully equipped with all the necessary inspection and diagnostic equipment, computer testing equipment, and hydraulic lifts to get under the vehicle. All of Auto P. I. Inspectors are highly trained ASE Certified Master Technicians with years of experience on both foreign and domestic vehicles. In addition, our Inspectors are Body and Frame specialists to determine previous accident damage and the quality of all repairs. It takes this combined knowledge to perform our comprehensive, 600-point, mechanical, electrical, body and frame inspection. 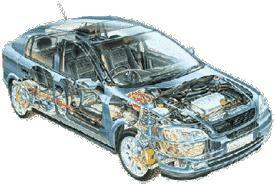 Our Inspectors are qualified to inspect and evaluate every system and component of the vehicle. The Auto P. I. 600-point inspection includes the entire drive train, which is the engine, transmission, differential or front wheel drive unit. We also inspect the brakes, suspension and steering system, exhaust system, cooling system, A/C system, the battery and electrical systems, all the electrical accessories, and a computer check of the on-board diagnostic system. The Master Technician will also perform an undercarriage frame inspection looking for previous accident damage, rust and flood damage. If the vehicle has been wrecked or flooded, we’ll let you know the extent of the damage and the quality of the repairs. The Master Technician then road tests the vehicle to determine any driveability problems such as transmission shift quality, clutch operation, engine performance, as well as alignment, steering and braking problems. Our Technicians are looking the tell tail signs of damage, misuse and abuse of the vehicle. The results of our 600-point inspection are given to you in a very detailed computer generated report. Please note that the front of the inspection report takes the 600 points and divides it into 6 major sections and into 120 categories and comments. This verbal and written report is given onsite or the Inspector can call you with the results and email you the report. The Master Technician will summarize the positive and negative aspects of the vehicle and will inform you of any mechanical and electrical problems, previous accident/frame damage, odometer discrepancies, and any other systems needing repair or maintenance. The Master Technician will give you the approximate costs for all mechanical and electrical repairs. Buyers can use this information to help re-negotiate the selling price or have the seller fix any needed repairs before purchase. Some dealers and sellers use a CARFAX or vehicle history report to sell their vehicles. Beware, these vehicle history reports cannot replace a physical inspection. A title search or history report cannot tell you the current condition of the vehicle, if the vehicle has any existing problems, or the quality of any previous repairs. However, the Auto P. I inspection includes a title search from the Texas Department of Motor Vehicles to determine any title discrepancies and a search for any open factory recalls for the vehicle. Today's used cars are very complex. Don't rely on a friend, relative, shade tree mechanic, or junior mechanic to "check it out". Auto P. I. uses only ASE Master Certified Technicians that are also Body & Frame Specialist to properly determine the true condition of every component and system before you purchase. When you purchase a used vehicle from a used car lot you are required to sign an "AS-IS" document. The document states that " The buyer is responsible for all repairs after the sale". When buying a used vehicle, don't be fooled by a freshly detailed car and a steam cleaned engine. You need to know the true condition of the vehicle before you buy. Beware of the individual seller or salesperson that tries to talk you out of your right to have the vehicle professionally inspected by a Master Technician. Any reputable dealer or seller will encourage you to get an unbiased inspection before you buy. There is no reason to buy someone else's problem vehicle. A pre-purchase inspection from Auto P. I. Used Car Inspections is completely unbiased. Unlike service stations or repair shops, Auto P. I. does not perform any type of repairs. This allows our Master Technicians to give an honest, unbiased evaluation of the vehicle. Our pre-purchase inspections have been featured on many consumer stories in radio, TV, newspapers, and nationally on ABC News 20/20. A pre-purchase inspection from Auto P. I. Used Car Inspections will save you money, time, and headaches. To schedule an inspection call us at the number below. All inspections are scheduled by appointment and we try for same day service or first appointment next day. Since Auto P. I. Used Car Inspections is a mobile service, you have the option of meeting us at the inspection site, or the Inspector can inspect the vehicle, and then contact you with the results of the inspection. What a Pre-Purchase Inspection Can and Cannot Tell You. A pre-purchase inspection is a snapshot of the vehicle's current condition. A professional pre-purchase inspection should discover all existing problems, previous accident and frame damage,	and any abuse and misuse of the vehicle. Knowing this information before purchase will help you negotiate a better deal and avoid costly existing problems. However, there are no diagnostic tests or equipment that will let you know when a mechanical or electrical component will fail. Every component or system will fail at some time regardless of any pre-purchase inspection. A professional pre-purchase inspection by an ASE Master Technician and Frame Specialists will discover existing problems and accident damage before you buy.